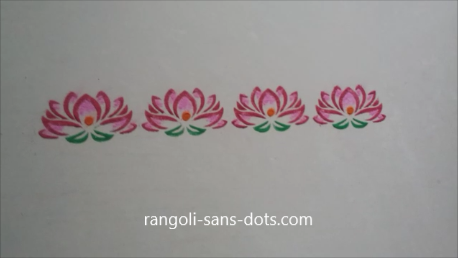 While lotus is one of the most favored patterns in our rangoli designs ( In South India this pattern is quite popular during Navratri and Varamahalakshmi Pooja ) drawing it free hand may be difficult for some of us. 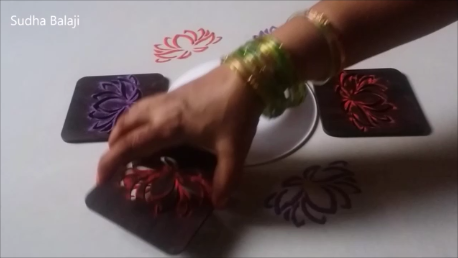 While browsing the internet I discovered that there are table coasters with lotus patterns on Flipkart. 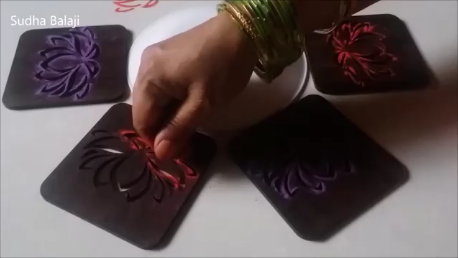 These can be used as stencils . 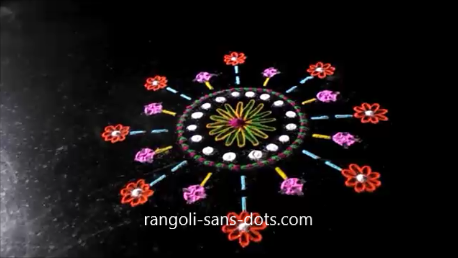 The result a beautiful multi colour rangoli design that is is a perfect circle also. 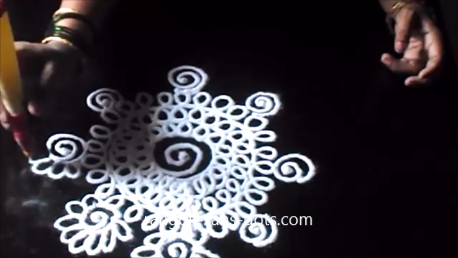 Gaps can be filled with patterns according to our imagination. 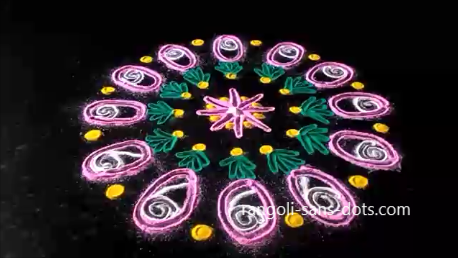 The first rangoli in this collection of images and videos. 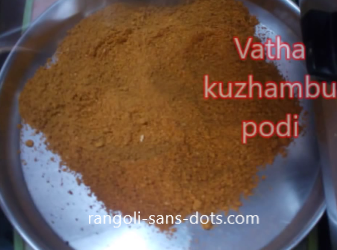 The CD can be used to a get perfect circular pattern around which we can extend the lines as shown. 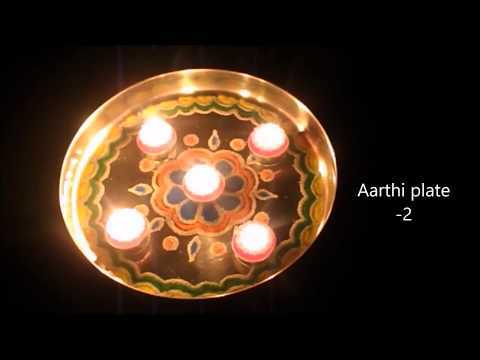 Light diyas around the flowers or in the gaps to get the festive atmosphere as in the case of Diwali. 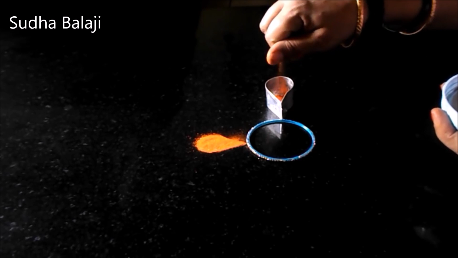 Place a CD and other CDs around so that they all touch each other. 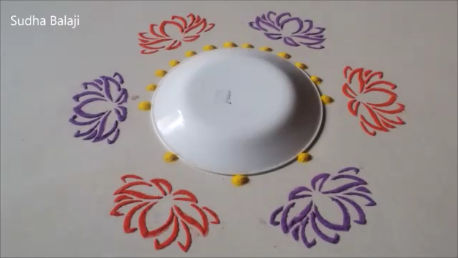 Fill the holes in the CDs with white or any other colour rangoli. Remove the CDs carefully. 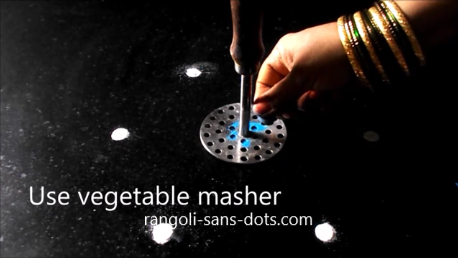 Use a vegetable masher ( when we use tools that are used in cooking it is preferable to buy one exclusively for making rangoli to avoid contamination with chemicals that may be mixed in rangoli powder ). 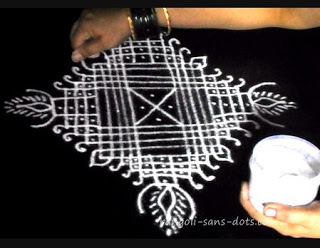 Place it at the centre and fill the holes with two colours one for the holes in the periphery and another colour for the remaining holes inside. 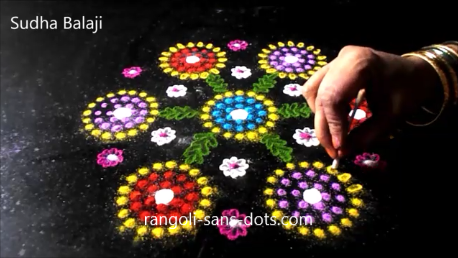 Repeat this process for all the white dots. 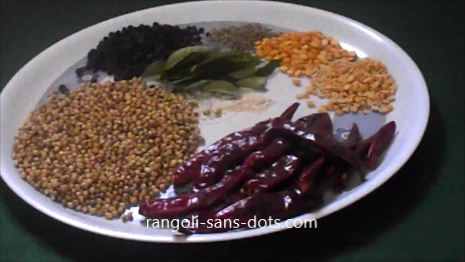 The result is the pattern as shown in the image. 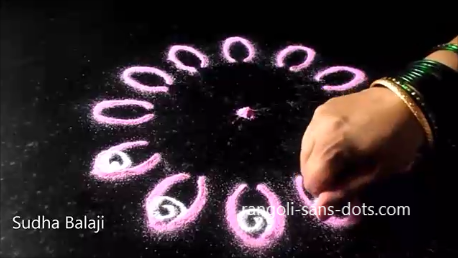 In the gaps place white and pink dots as shown in the next two photos and make floral patterns with cotton bud. 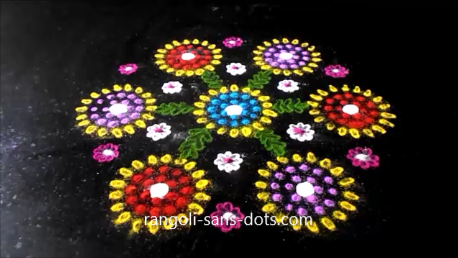 Fill the white and pink flowers with pink and white dots respectively. 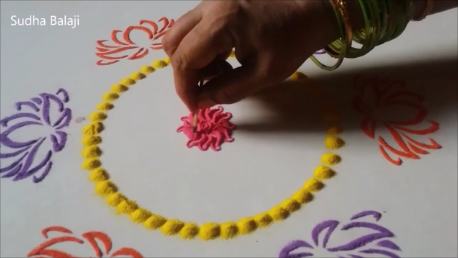 Now using a cotton bud make patterns out of the yellow dots to get a design that represents a flower. 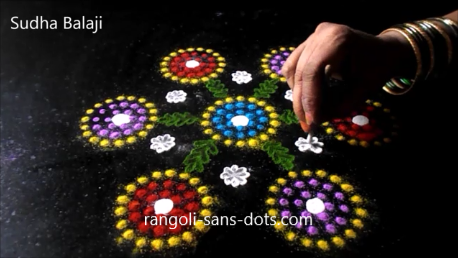 A simple trick to get a colourful rangoli for festivals like Diwali and Navratri. 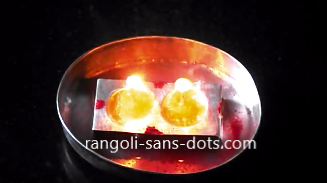 Both have crossed more than a million views on YouTube without me sharing them anywhere, I just left it to YouTube as I usually do for all my YouTube videos. 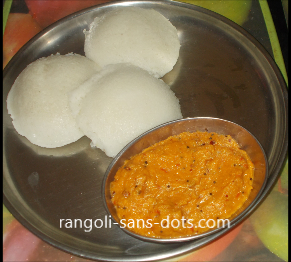 I do not share on any social networking sites. 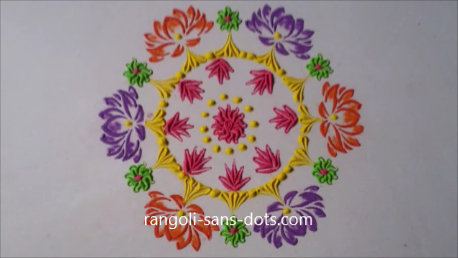 This video shows how CDs can be used for creating rangoli and the second video shows how paper cups can be used for creating rangoli. 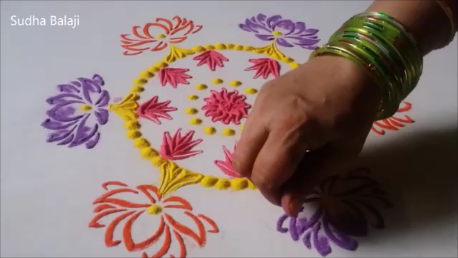 The major advantage of these techniques or tricks is that the tools themselves take care of the symmetry. 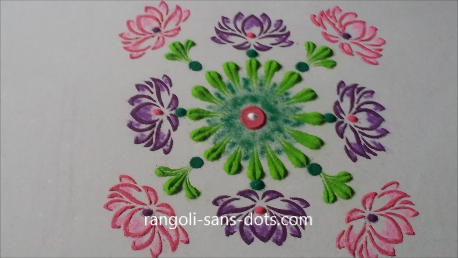 The only area where we have to concentrate is to see that the CDs or cups that we use for creating rangoli touch each other to ensure that the design does not become asymmetrical. 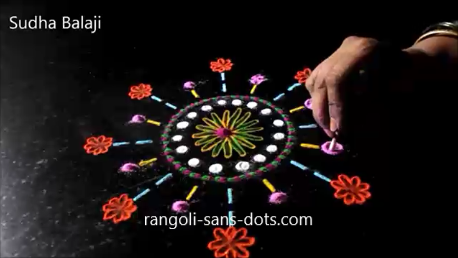 Rest is left to our imagination to fill colours in the gaps, holes . 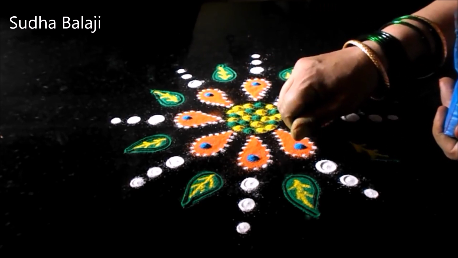 Remove the tools that we use and develop further on the pattern that is available on the floor using fingers, cotton buds or tooth picks . 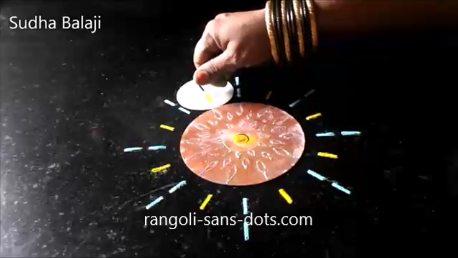 This rangoli with paper cup and the previous video with CDs I thought of when I was trying to find a solution to the problem to a number of my regular viewers who through comments, through mail and through messages on my Facebook page - Rangolisansdots - conveyed their difficulty - though they liked many of my videos , they found it difficult to make rangoli designs using the traditional rangoli drawing methods of using the fingers. 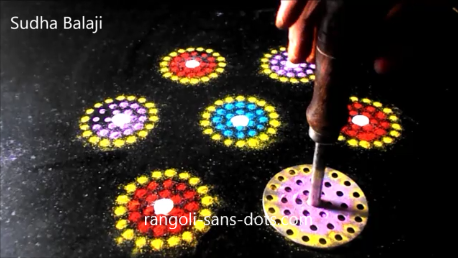 For them and for children , I wanted to ensure that their interest in rangoli making is not dampened by this handicap , so these two and other innovative rangoli making tools were "discovered "
The next rangoli is a traditional rangoli pen or gun technique. 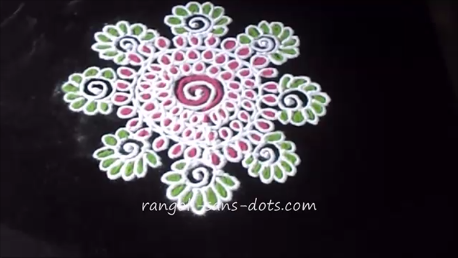 We can use chakli templates or murkku acchu as we say in Tamil for creating easy designs for rangoli Already we have patterns stamped in the chakli templates so it easy is quite easy to create the designs. 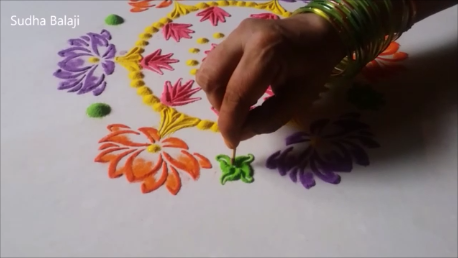 Another idea I have tried as a rangoli making tool that is readily available at home or shops is the Popsicle or ice cream sticks we use for crafts. 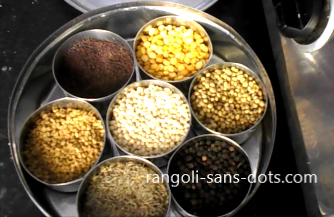 One sample representation through a couple of pictures in the patterns below. 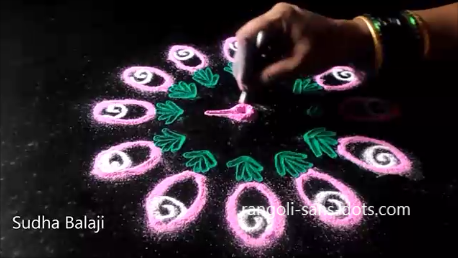 Drawing floral petals , free hand may be difficult for some of us. 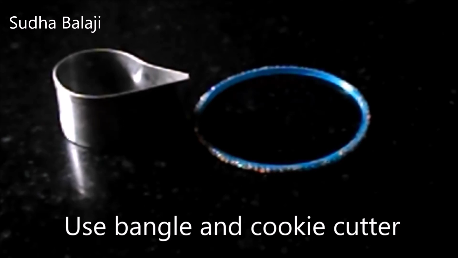 So I thought of this idea ( I try to make of items available in our households ) using a cookie cutter . 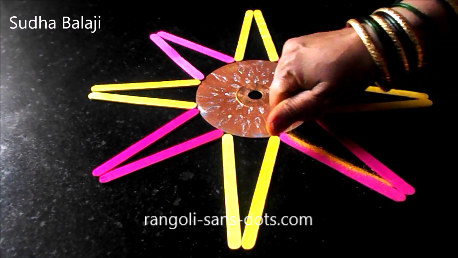 Place the cookie cutter in different places around a bangle, fill with colours of rangoli. 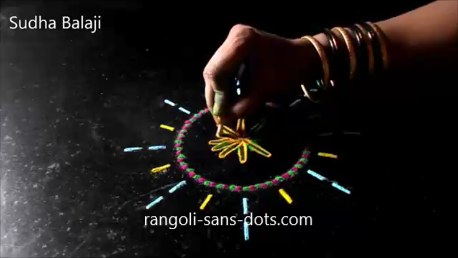 Rest is our imagination for decoration. 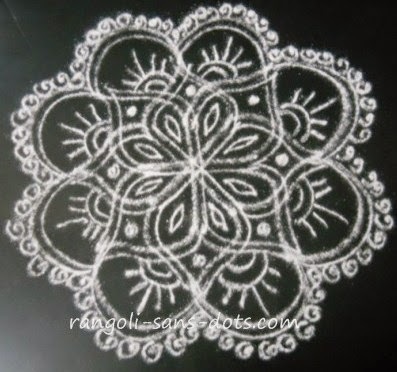 After placing the spoons in a radial pattern , rose buds are created in a rangoli . 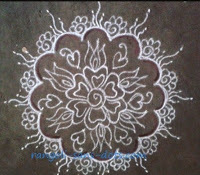 We can make bigger rangoli by placing the spoons around a compact disk ( CD ) or plate and decorating inside the plate too. 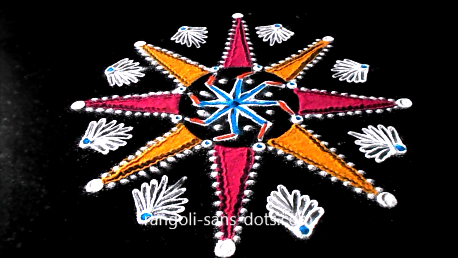 The permutations and combinations are infinite as in the case of traditional rangoli designs.